Mitchell’s first season at the top was that of 1888/89 and in the Kilmarnock FC Sports on 4th May, 1889, he won the half-mile and the Glasgow Herald had this to say: “The half mile race proved an interesting event, Mitchell (St Mirren) kept his distance all round, and slightly increased it in the straight. Blane, scratch, was second. ” He followed this with victory in the Abercorn Sports 880 yards (confined to the district of Paisley) one week later in 2:13.4. He continued to run well and in the SAAA Championships at Hampden Park on 22nd June, he won the 880 in 2:01 for his first major title. 6th July saw Mitchell in action at the Rangers and Clydesdale Harriers Sports at Ibrox and running in the 600 yards: “Great interest was centred on this contest as it was given out that Mitchell would attempt to break the record. This he failed to do and for that matter failed to finish at all. When three men made their efforta great race ensued for 100 yards, but Mitchell could not stay the pace and gave up 40 yards from home. Logan and Blair ran a punishing race, the Vale man winning by a yard from Blair.” The result as published: 1. J Logan, Vale of Leven; 2. T Blair, Queen’s Park; 3. R Mitchell, St Mirren. Time: 1:19.6. A week later, 13th July, and Mitchell was competing in the half-mile at Falkirk FC Sports at Brockville. Result: 1. R Mitchell (champion, St Mirren FC and CH); 2. A Marshall (ex-champion, DAFC); 3. GM Thomson (CH). Time: 2:07.6. The St Mirren FC Sports were held over two Saturdays with the first session being held on 20th July and was largely a day of confined events plus the preliminaries of the four a side football tournament. However the event of the day was another 600 yards race with the principals being Logan, Blair and Mitchell. On his home turf of Westmarch in Paisley, Mitchell was a different runner to the one who had failed two weeks earlier. The report on the race read: This event did not come off until after the finish of the football competition. When the three well-known athletes – Logan, Blair and Mitchell – came out, there was considerable excitement among the crowd which was unusually large for a preliminary day. As they toed the mark, the men were loudly cheered. The inside of the track was secured by Logan. Blair went to the front at once, and passed the post for the first time leading by two yards, Mitchell second and Logan last. In the back stretch, Logan passed Mitchell, On entering the straight all three were together, and then Mitchell dashed to the front and led home, easily six yards in front. Blair was second and Logan third. Time:- 1 min 16 3-5th sec. This is the second time that Mitchell has covered the record. He received a fine ovation from the crowd, and was carried into the dressing room.” A prolific racer, Mitchell contented himself with winning the confined 100 yards at the second day of the St Mirren Sports the following week where, running from scratch he was timed at 10.4 seconds. The reason for the easier week might be found in his performance on 3rd August at Ibrox in the joint Rangers/Clydesdale Harriers meeting where he broke the 600 yards record. The comments in the Glasgow Herald’s Notes wee that the day had suited him – the air was on the sultry side – but he ran a magnificent race and “but for the task imposed upon him by the handicapper, he would not have broken record; it drew him out as he has not been drawn in any of the scratch races with Blair and Logan. In this race the handicapping was very fine, the finish being so close and exciting that those who saw it are likely to refer to it for many a day to come as an historic race. Mitchell only wants to be drawn out in the half mile as he was in the 600 yards on Saturday and he will beat the record established by Moffat of the Montreal Athletic Club some years ago. For weeks, Mitchell ha studiously avoided running in the western district half mile handicaps. The last handicap he took part i in the district was an evening meeting at Hampden Park; and though he then considered the task beyond his powers, he romped home a winner by 20 yards. Mitchell should bear in mind that handicaps were instituted for two main purposes – firstly to give all a chance; and secondly, to make good men accomplish good time.” As for the race, there were eleven starters, first across the line was J Russell (Clydesdale Harriers) off 26 yards, secpnd was Mitchell (scratch) and third was John Blane (CH, 13 yards). Blane had been a cyclist and football player who set a Scottish record (4:30.2) for the mile in 1888. We can leave summer 1889 there – it had been a good year for Mitchell with his first SAAA title and a Scottish record to his credit when he went into winter ’89/’90 heading optimistically for 1890. Comment has been made on his busy racing programme and this is evidenced by the entry by his name in the Clydesdale Harriers Handbook at the end of the season. After noting his address in Ferguslie Street, Paisley, it noted that he had won 13 first prizes, 2 seconds and 2 thirds. He had also won a silver medal which the club gave to members who won a championship racing under the club’s name and another for running 2:01 for 880 yards. 1890 and Mitchell did not take part in the first session of the Abercorn Sports on 10th May: he must have run in the second session on 17th but we only know because he won the Consolation Race at the end of the meeting from TW Young, a very good sprinter from Clydesdale Harriers. He was uncharacteristically quiet for several weeks and a hint of why that was case appeared in some comments on the Queen’s Park FC Sports of 7th June, 1890: “the 600 yards scratch race was looked upon as one of the events of the meeting. Both Mitchell and Logan had kept themselves fit for it, and as Mitchell held the record it at 1 min 15 3-5th sec, the contest excited great interest. The race was run at a due pace throughout, Blair of the QP winning on the tape by a few inches, but the time was 5 1-5th secs slower than Mitchell’s record.” The finishing order was Blair, Mitchell and Logan “after a desperate struggle.” They were clearly well matched over that distance with all three having won a close fought scratch race. The SAAA Championships were held at Powderhall on 21st June and Mitchell faced miler John Blane in the 880 yards. The race went as expected with Blane taking the pace out hard, Mitchell sitting in and coming past to win by six yards in 2:03.2 for his second consecutive championship victory. One of the high-spots of Mitchell’s career came on 19th July when in the first day of the St Mirren FC Sports, he won a half-mile race, confined to Paisley, in which there were ten runners and won in a new Scottish record time of 2:00.4. The previous record was recorded by T Moffat of Montreal AC who in Edinburgh in June, 1883 ran 2:00.75. There were several very good half-milers in Scotland at this point and the chase for the sub-two half mile was on. Hopes were high for an improvement on this at the second day of the club sports a week later and, in the handicap 880 yards, two watches were kept solely on him. He finished fourth in exactly the same time as the previous week which as the report said, “established his new record.” With the championships over, a new record for the half mile set and equalled, his season was pretty well over. He did compete at the Celtic FC Sports on 9th August where he won his Heat of the 100 in 10 seconds but did not feature in the results of the final. Another good season and anther Scottish record. 1891 The Glasgow Herald on 11th May in their column headed ‘Special Notes on Athletics’ began: The popularity of football knows no bounds. Despite the many counter-attractions , fully ten thousand persons assembled in Celtic Park on Saturday to welcome the Renton who made their first public appearances since being reinstated. The amnesty granted by the Scottish Association has been fully taken advantage of, and as on Saturday there were three of Renton’s old slaves – Hannah (Everton), Lindsay (Accrington) and Harvie (Sunderland) – in the team that faced the Celtic. The village lads stripped on the field …” Football always comes into the question but there were several athletic meetings that day – the Glasgow Police Sports, the Glasgow Academical Sports and the big one waas the Clydesdale Harriers Sports. Here there were 21 runners in the half mile and Mitchell, running from scratch could not “collar his man” and finished third. A week later, at the second day of the Abercorn FC Sports Mitchell was out in the 220 yards where he won his Heat in 24.4 off 7 yards and finished second in the Final. In the West of Scotland Sports on 23rd May he ran in the half-mile (won by Walter Malcolm) but he was unplaced. June is always the big month for athletes with the SAAA championships looming towards the end of the month. The traditional start in June was the Queen’s Park FC meting but Mitchell was not to be seen there. Indeed he was not seen until the 20th of the month when he won the 880 yards at the Scottish championships to make it three-in-a-row with the only trouble coming from Walter Malcolm who was comfortably beaten in the end. Wining time was 2;03.2. In the first day of the St Mirren Sports on 18th July, he ran in the confined 880 yards but could not get through the field. The following week at the second day of the Sports, he did not compete at all. The first Saturday of August was the Rangers Sports and the comments were that he had run in the 880 yards smoothly and with more ‘dash and gameness’ than at any time in the season. However, although unplaced he was timed at 2:03.4. In 1892, he appeared in the first day of the Abercorn FC Sports on 16th May where he ran in the 880 yards confined to Paisley and won from scratch in 2:06. The following week, 23rd, on the second day of the Abercorn Sports, he ran in the open 440 yards handicap and although he qualified from his Heat, was unplaced in the final. Then on the final Saturday of June, he was second in the open 440 yards handicap, running from the same 6 yards mark as the previous week, at the Vale of Leven Sports. This led up to the SAAA championships held at Carolina Port, Dundee on 25th June. Mitchell won the half mile for the fourth consecutive year in 2:05.2 from Walter Malcolm. In the Rangers Sports on 6th August Mitchell ran in the 440 yards handicap where he finished second in his Heat ( 6 yards) and was third in the final. The report on the Celtic Sports the following week began:“The opening of the new ground f this powerful athletic organisation marks a new epoch in the athletic prowess of Scotland.” New ground opening = top class runners. That was certainly the case for the 100 yards with Willie Maley himself running (7 yards), Hugh Barr (6 yards), and Mitchell (9 1/4 yards) and a total of 10 heats. Mitchell was unplaced in the final which was won by Bradley of Huddersfield and Salford Harriers. There was quality all the way through the meeting which was peppered with invitation events for runners and cyclists alike. The Morton FC Sports were held on the third Saturday in August but Mitchell did not turn up at that one and the season was over at that point. 1893 started with the Morton Sports on 29th April – Morton FC held sports meetings at either end of the summer season and they were very popular with the athletes. At this one Mitchell ran in the 220 yards and qualified for the final where he was unplaced, and the 440 yards where he was third in the final after winning his heat. At the Abercorn FC Sports on 20th May, Mitchell was once again competing in the 100 yards where he won his heat in 10.8 from 6 1/2 yards but was unplaced in the Final. He was not forward in any other event that day. Mitchell did not seem to be racing as much as in previous years for reasons that were never laid out in the popular Press – this was also true of the SAAA Championships held at Hampden ; on 17th June. The half mile was won by Walter Malcolm from J Hindle by a yard and a half. As far as club affiliation was concerned, the Clydesdale Harriers Renfrewshire Section had been given its independence but he remained connected to Clydesdale Harriers Headquarters District No 5. He must have been paying the sub or he would have been struck off the list. At this point he was CH for the Harriers Sports, St Mirren for the football club’s sports and Ch & StM for most other events! In 1893 he did not compete in the St Mirren Sports at the end of July, the Rangers Sports at the start of August or the Celtic Sports two weeks after that. His summer was effectively ended at that point. 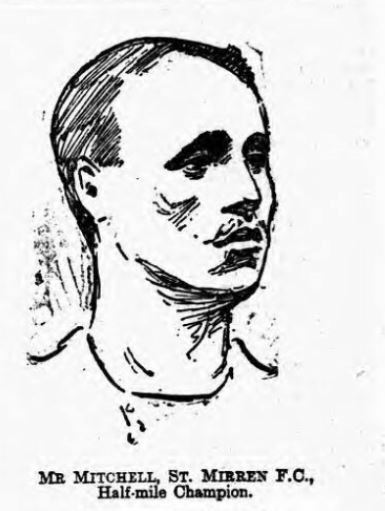 In 1894 on 19th May, at Abercorn Sports, Mitchell was out in the 220 yards where he was 1st in Heat (23.4) but only second in the Final On 2nd June, at the QPFC Sports, his event was the 880 yards handicap which he won from 16 yards, half a yard in front of Robert Langlands (who would be the first Scot to break 2 minutes for the 880 yards, in 2:02.6 and also finished third behind the talented Rodger of Maybole in the invitation 600 yards. Came the SAAA Championships he was second in the 440 yards to Downer. The Glasgow Herald reporter commented that “Mitchell, who was fancied, was Downer’s strongest opponent, but he drew up six yards from the tape when he saw Downer was winning.” He also turned out in the 880 which he won in 2:05.4 “R Mitchell Abercorn FC, easily put the half mile to his credit in 2 min 9 3-5th sec” Note that he was listed this time as a member of Abercorn FC (another Paisley team) and not St Mirren: under the rules of the time he was still a Clydesdale Harrier and at times entered or was reported as such. A single week later, 30th June, running under the Clydesdale Harriers banner, he won the half-mile at the Clydesdale Harriers Sports at Ibrox Park in 2:01.6 by half a yard from Maybole FC’s J Rodger, running in the colours of West of Scotland Harriers. It had been another successful year in terms of national medals won and opposition scalps lifted, but it was another short one, if we are to go by how often he appeared in the second half of the season. In fact he did not appear in the prize lists of any of the major Saturday games or sports, as in the previous year nor only did he miss the weekend sessions of Rangers or Celtic Sports, he did not even appeara at the supplementary meetings. And it was on to 1895. The Scottish Amateur Athletic Association was very powerful in the east of Scotland but not so in the west. Clydesdale Harriers was by far the strongest club in the west with five sections in Glasgow and affiliated sections in Lanarkshire, Dumbarton, Renfrewshire and other areas. There was a dispute between the Association and Clydesdale and a parallel body to the SAAA, the Scottish Amateur Athletic Union, was set up with membership largely but not exclusively from the west of the country. Each body had their own meetings and their own championships – Clydesdale was the main body in the Union and there had been a big meeting in Paisley on 18th May, as in other centres of population, where St Mirren, Abercorn and the other clubs in the area decided to follow the Union. It was at their championships on 22nd June that Mitchell won his final national medal. Mitchell did run in the half-mile but there were only two competitors, himself and RS Langlands of Clydesdale – and the pace set by Langlands was such that his opponent dropped out – Langlands went on to win in the time of 1:59.8 which was the first time that two minutes had been beaten in Scotland. It was 0.6 sec faster than Mitchell’s best ever, and 0.4 sec better than Walter Malcolm, who had died earlier that year, had run. Mitchell also ran in the 440 yards and finished third, the race being won by Roger of Carrick Harriers. His season was was really at an end, and in fact he would never, ever be as good as he was. The countdown to the 2minute half mile had been begun by Moffatt of Montreal AC in June 1883 with 2:00.75 and Mitchell had brought it nearer with his 2:0.4 in July 1890. The next baby step would be taken By Walter Macolm, Morton FC and Clydesdale Harriers. Mitchell was a great competitor who had packed racing schedules in his early days with a range of events from 100 yards to the half mile, and ended his career with five SAAA titles to his name – by the Association’s centenary in 1982 only one man (Duncan McPhee) would have equalled it and none bettered it. Unfortunately though his career ended in disgrace. The SAAA was formed in 1883 and the Amateur code was very strictly enforced and adhered to. The 1890’s were fraught with abuses of the rules and there were investigatory committees set up in 1893 and later to investigate these. On 6th October, 1898, one such committee recommended that several athletes be disciplined: three for impersonating other runners in a meeting in Ireland, three for being involved in that offence and for betting betting.and three including Mitchell, Roger of Maybole and Blackwood of Johnstone for betting. As a result this excellent athlete was suspended indefinitely.